From these as well as other passages in both the Old and New Testaments we ought to be able to see clearly that there is some sort of a problem in regard to riches and moneymaking. Quite obviously the problem is complex and cannot be reduced to saying that all the rich are evil and will end up in Hell nor that the desire for material goods is evil. Neither of these statements is true. Neither, however, can Christians accept the modern world’s attitude toward riches and material things, an attitude which fails to see that there is anything to be troubled about. Catholicism, when it has been free to be true to itself, has always set up safeguards around the activities connected with money and the accumulation of wealth, safeguards for the common good and health of the community, as well as for the spiritual safety of the individual possessor of wealth himself, precisely because the Church knows the weakness of man and his propensity to sin. Because of the original disaster that affects all of Adam’s descendants, man tends to disorder, his appetites tend to revolt against his reason. We see this clearly in reference to our sexual appetites, but perhaps twentieth-century Catholics do not see this quite as clearly in regard to our appetite for pecuniary gain as did our medieval fathers in the Faith. Moreover, I think that we have not always well understood what it is about our sexual appetites that is disorderly. Some, I fear, have tended to see sexual desire as in a class by itself, either somehow inherently evil, or at least tainted. But this is not the correct way of looking at the matter, for the problem is not in our sexual desire itself, but in the entire integration of our human nature. Man’s sexual appetite and all that naturally goes with it were quite obviously created by God, and thus share in the original Divine approbation, “And God saw everything that he had made, and behold, it was very good,” Genesis 1:31. They were created for a purpose, namely to bring new human beings into the world, and ultimately into Heaven, in cooperation with Almighty God. What is wrong with our sexual appetite today, and indeed since the Fall, is that the appetite tends toward objects with whom it is impossible to obtain the end for which that appetite was given to us, that is, to beget children and bring up those children in the circle of a loving family. Our sexual desire, one of our concupiscible appetites, is indiscriminate and blind in its wants. Instead of being readily subordinate to its controlling purpose, the begetting and subsequent rearing of children, it simply wants what it wants. In the state of original justice the intellect easily ruled over all subordinate aspects of man, and thus would effortlessly have directed a man’s sexual desire exclusively toward his spouse, but since Adam’s sin this has not been the case. In our present condition we must all struggle to subject the concupiscible appetites to the rule of reason. But in this hard work of ruling our blind appetites we do not do anything against what is natural for us. We were created with reason as the ruling element in us and it is impossible to make sense of human beings in any other way; thus to restrain our blind desires within the bounds of reason, though at times a bitter effort, is simply to live as is natural to man, in fact, to live according to nature. A similar thing is true of our desire for material things, which is the basis for man’s economic activity and all that goes with it. Since we have bodies we need material things, and this would have been true had the Fall never occurred. But instead of asking why we need material things, we make them ends in themselves, not means toward allowing us to cultivate what is important in life, namely, our spiritual lives, our intellectual lives, our family and social lives. As with our sexual appetite, our desire for money and material goods is now more or less indiscriminate and inordinate in its wants. But also as with our sexual appetite, our appetite for material goods was created for an end. Material goods exist for the sake of the more important aspects of our lives. Such goods are good only to the extent that they facilitate our easier attainment of spiritual, intellectual, family and social goods, just as sexual activity is good to the extent it furthers one of the three ends of marriage. And just as the sexual appetite run out of bounds hurts not only the individuals involved but the entire community, the same is true of our appetite for economic gain. Adam Smith notwithstanding, it is not the case that if each man seeks his own gain to the utmost the community will necessarily benefit thereby. History as well as common sense teach otherwise. One of the main reasons why this is so hard for many otherwise orthodox Catholics to grasp today is, I think, that we have been so accustomed to attacks on free-market capitalism coming from socialists and communists, that we assume only they can have anything bad to say about our economic system. But just as the logic of looking at our sexual appetite and the role it ought to play in human affairs according to its own nature, leads us to conclude that man must put many restraints on his sexual conduct, which at the time feel as if they were going against his nature, but in reality are fulfilling that nature, in a similar fashion, if we ask ourselves fundamental questions about man’s capacity for and need of material goods, and look honestly at the disruptive effect unrestrained economic activity has on human society, we are led to propose strong curbs, curbs which indeed are different from those proposed by socialists, but which are equally contrary to our present system and to the desires of unrestrained greed. At every turn, therefore, there are limits, restrictions, warnings, against allowing economic interests to interfere with serious affairs. It is right for a man to seek such wealth as is necessary for a livelihood in his station. To seek more is not enterprise, but avarice, and avarice is a deadly sin. Trade is legitimate; the different resources of different countries show that it was intended by Providence. But it is a dangerous business. A man must be sure that he carries it on for the public benefit, and that the profits which he takes are no more than the wages of his labor. In the lands where these [new, non-Catholic] ideals had free play — Holland, Great Britain, above all New England, a new type of character was produced, canny, methodical and laborious; men who lived not for enjoyment but for work, who spent little and gained much, and who looked on themselves as unfaithful stewards before God, if they neglected any opportunity of honest gain. The second thing to which I would appeal in confirmation of the line of argument I am making, is the corpus of modern papal teaching on the economy. 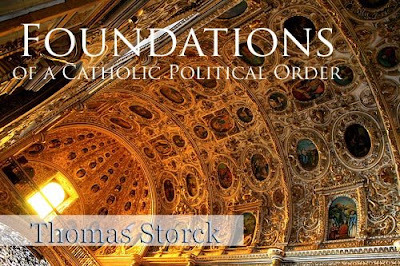 As is well known, this body of doctrine began with the encyclical Rerum Novarum of Leo XIII in 1891 and, as of this writing, has continued down to Centesimus Annus of John Paul II in 1991. Though diverse, in that they were for the most part addressing the immediate needs of widely varying situations — the economy of 1891 is not that of 1931 nor yet that of today — nevertheless several basic themes can be discerned. From the beginning, with Rerum Novarum, the Popes have made it clear that the economic system must serve mankind, and from this it follows that any particular economic arrangements must be judged on how well they in fact are serving the human race. Secondly, they have also pointed out again and again that it will always be necessary to bring other factors into the ordering of our economic affairs besides mere free competition. Some kind of legal framework is necessary to make sure that human goods are given their proper respect. One cannot depend either on the blind forces of the market or enlightened self-interest or even individual rectitude. Now the purpose of the restraints on economic activity which this attitude demands is twofold. On the one hand, if the activities of moneymaking and the accumulation of external goods are firmly put in their place, men will be able to concentrate on what is really of importance in life. Men of good will, who in a capitalistic economy and society might devote too much of their energies to material things and even get entirely caught up in them, will be deterred from this not only by the explicit teaching of the Church, but also by that of the state and of all organs of society, such as educational institutions and publications, as well as by regulations firmly administered, which aim to prevent the beginnings of wrongdoing in these matters. These same regulations, on the other hand, backed by appropriate sanctions, will also help to forestall the actions of truly bad men, who would otherwise harm their fellows and the society as a whole. Though no one can expect this apparatus to work perfectly, its aim is to uphold the common good by helping to enforce a notion of society that puts the general welfare first. Elsewhere Christopher Dawson notes that the traditional monarchies in Europe “had striven to keep the several orders of the polity within their appointed limits, to maintain the corporative system in industry, to regulate wages and prices, and to protect the peasants from eviction and enclosures.” This conception of society does not especially value some notions that are dear to Americans, such as continuous improvement in one’s standard of living or the chance to get rich. But it does aim to allow everyone to have at least enough, and to further ensure the maintenance of that social peace which is necessary if we are to apply ourselves to those things which are truly important. For if material goods exist only for the sake of other and non-material things, and if money in turn exists only for the sake of material goods, then money is twice removed from what is valuable in human life. But how a Catholic state actually tries to realize such an approach to living is the subject of the following sections of this chapter.